It has been awhile, a very long while, since I have posted here. I hope your knitting has been going well. My breast cancer came back , not in the breast but brain bone and lung. I had a chest x-ray not long ago and it didn’t show any lesions, whereas before starting chemo I had a pet scan which showed them. I am feeling good though, today is the best day I have had in several weeks, thank God. I can say I have missed my creative side. My mind was so fuzzy. I knew I was feeling better when I was going through some yarn and ideas started to flood my mind, and I was pulling yarn . Healing is an interesting process. One of the things I have found interesting during this process is LARP’s (Live Action Role Play, it is a game where you have a character you develop that you act out). There is one in Michigan that I thought looked like fun. I found out about it through some friends I met that LARP. Creativity can come in many ways, and I enjoy how my own creativity is stimulated by other types of and others creativity. This LARP is KANAR and is set in a medieval time period. I was planning on going to weeklong right before TNNA, but with my cancer coming back being fuzzy headed and mobility have been issues. I ended up having radiation to my brain for 10 sessions, then after that they started chemo. By the time I started chemo, I needed to use a walker as it was painful to walk. Then after the first cycle of chemo my blood counts took a nose dive, I ended up getting platelets and two units of blood, and being in the process of getting pain medicine managed so that my mobility is not gone. That has been an issue for me, because of the bone cancer. Walking has been difficult because of bone pain. Now it is much better, the medicine is getting fine tuned and I am making progress. It was pretty scary for me when I was fuzzy headed as it affected my creativity. 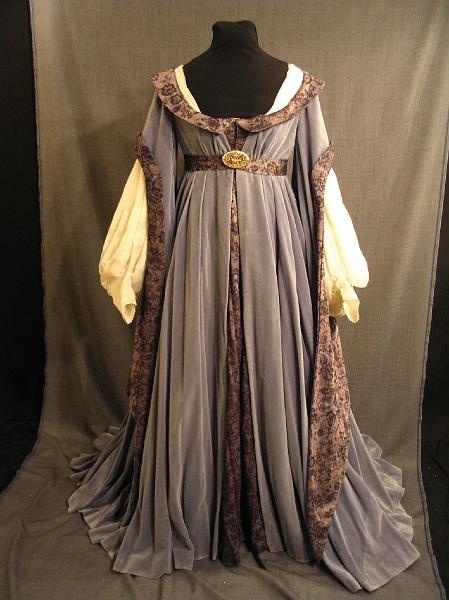 One thing that I was thankful for with looking at going to the LARP weeklong was that looking at the medieval dresses was very stimulating creatively. So was planning the story of my character. I find that when I am in a slump looking at things outside knitting can flood me with new ideas for knits. Don’t be afraid with your knitting to look at things OUTSIDE knitting, for inspiration. you may see color combinations you like, textures, silhouettes, drape, line, the list goes on. Color I suppose is the most obvious but enjoy the things around you with an open mind and eye as to what is beautiful to you. You can apply this to your knitting and it will empower you. To my family and friends, I love you so very much. Thank you for all you do for me. To my knitting friends who have been praying for me or sending good karma my way, thank you so much! I am making progress and I appreciate what you are doing for me. Please keep it up! To my friends at week-long, I wish you a happy and full week. I am so sorry I could not join you. To those going to TNNA, I am sorry I will miss you there. Next-year my goal is to be there.